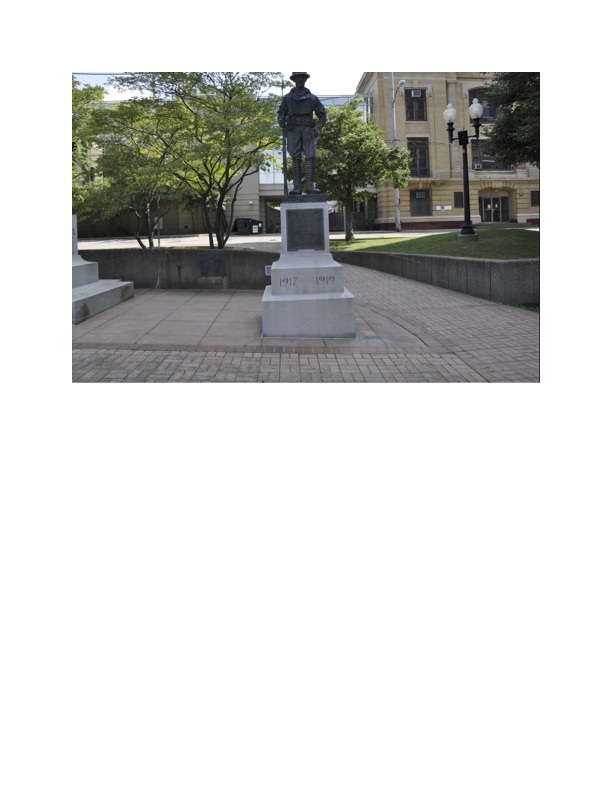 Akron, "Spirit of the American Doughboy"
Address : North lawn of Summit County Courthouse, 209 S. High St. 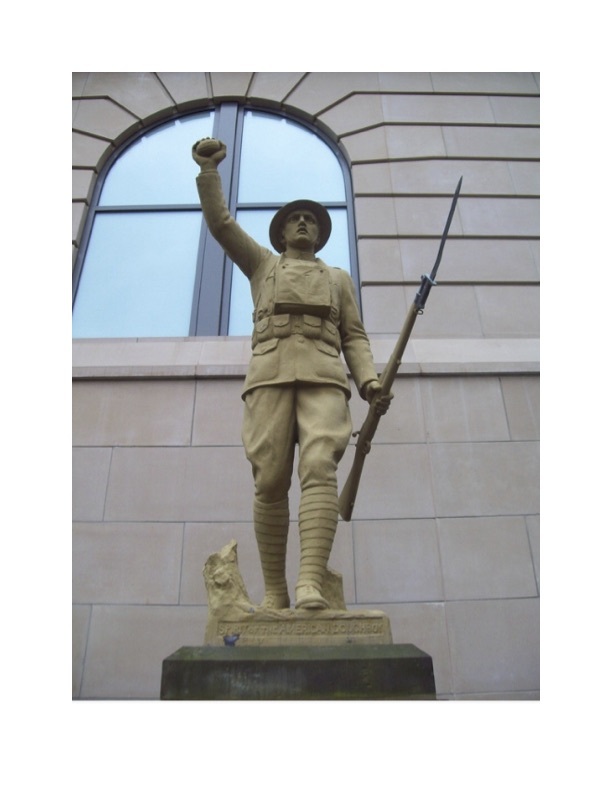 This cast bronze statue of a WWI infantryman has been painted mustard yellow. 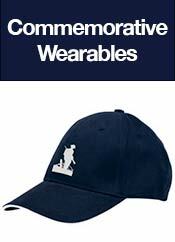 It depicts him advancing through the stumps and barbed wire of No Man's Land, carrying a rifle and grenade and wear­ing a steel helmet, gas mask, bag and ammunition belt. 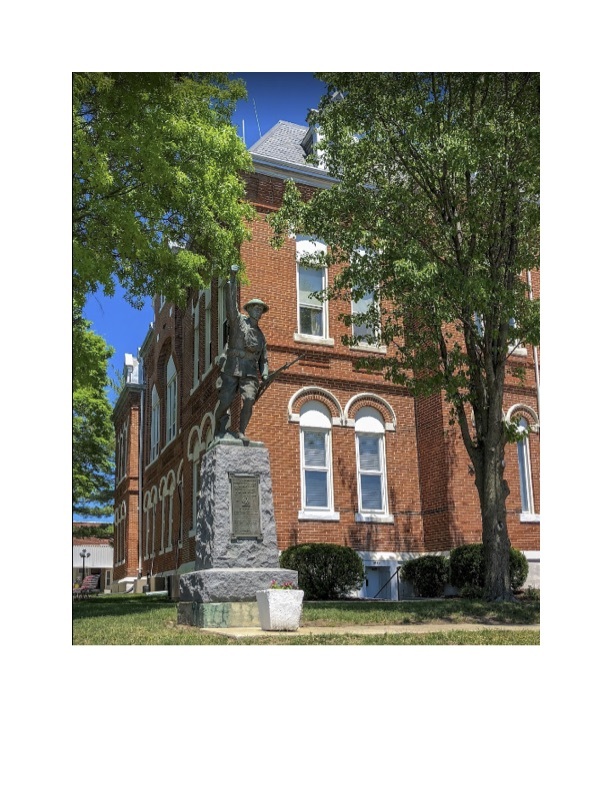 Beneath is a granite slab and sandstone base, with a plaque dedicated to the mem­ory of the men and women who served in WWI from Summit County. Other plaques list the 65 men and one woman from the county who died in service during the war. It was installed at the Ar­mory in 1934 and moved to the present site in 1982. Address : 100 Overton Access Rd. 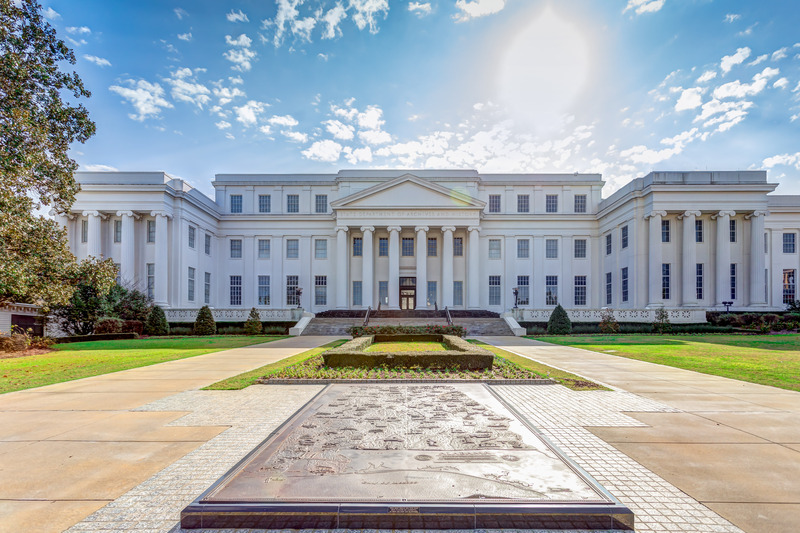 Address : Alabama Department of Archives and History, 624 Washington Ave. 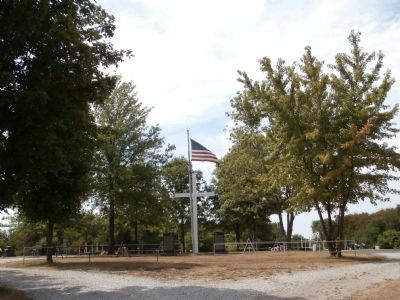 The base of the flagpole is a square column of granite eight feet tall and two and a half feet on a side. It has three rectangular panels with relief images of two soldiers with a dog and birds, two soldiers with a horse, and a soldier walking with nurses. On the fourth side are the names of 145 who died in WWI. It was sculpted by Gertrude Katherine Lathrop (1896-1986) and dedicated in 1933. 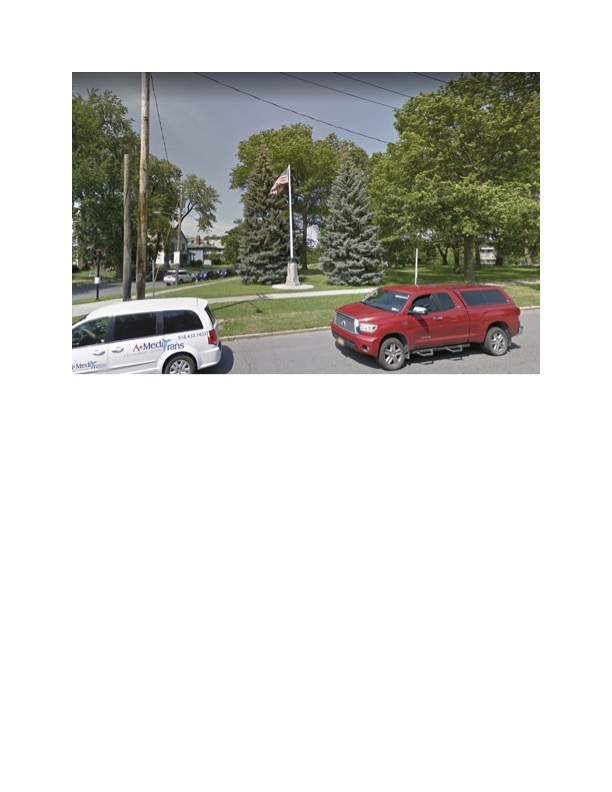 Address : County Courthouse, Polk and Wood Sts. This bronze WWI infantryman is advancing through the stumps and barbed wire of No Man's Land, holding his rifle in one hand and a grenade in the other. Beneath is a rusticated marble or granite base. This was sculpted by E.M. Viquesney and dedicated on May 30, 1926, to the Gentry County citizens who served in WWI. It was rededicated on August 24, 1984. 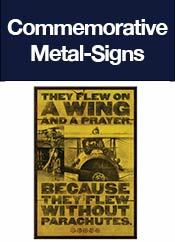 This is a metal flagpole installed in the center of a low semicir­cular granite wall decorated by an American Legion emblem. 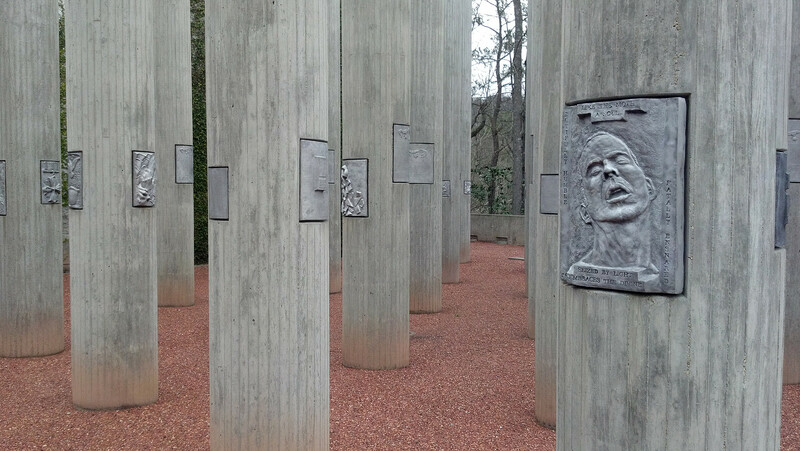 On each end of the wall is a bronze plaque. 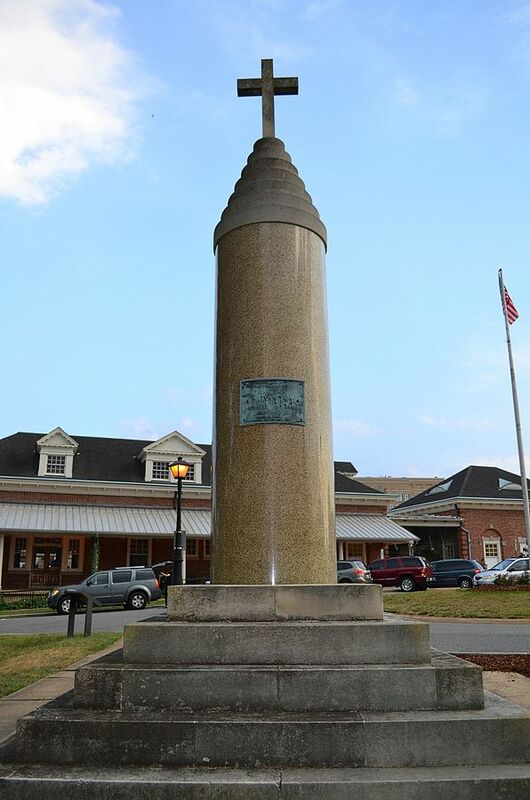 The memorial was erected in 1930 as a tribute to Albert T. Wood, the only Longmeadow sol­dier killed in action during WWI. He died in the Battle of Argonne Forest on October 20, 1918. Address : Former Bernalillo County Courthouse, 415 Tijeras Ave.
A bronze plaque mounted on a granite boulder was placed here in 1962, designed by sculptor Worg. 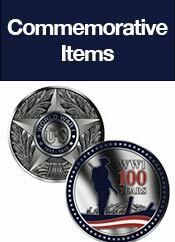 It commemorates the 1,750 men from Bernalillo County who fought in WWI, approximately 50 of which were killed in service. In 1910, Freemasons in the United States created the George Washington Masonic National Memorial Association (GWNMMA) to construct a memorial to George Washington somewhere in Alexandria, Virginia. A site atop Shooter's Hill was chosen, and ground for the massive memorial building and tower was broken at noon on June 5, 1922. Laying of the memorial's cornerstone occurred on November 1, 1923. By February 1924, the foundation was complete. To support the tower eight massive granite columns were placed on the floor of the first story. The floor of the second story was built atop them, and eight more massive granite columns placed above the first story columns. The roof of the second floor was supported by this second set of columns. The tower above rested on these second-floor columns. In December 1924, the installation of eight green marble columns (each weighing 11 to 18 tons) occurred on the first floor. Each column was 18 feet (5.5 m) high and 4.5 feet (1.4 m) in diameter, and arrived at Alexandria's Union Station by train from Redstone, New Hampshire. 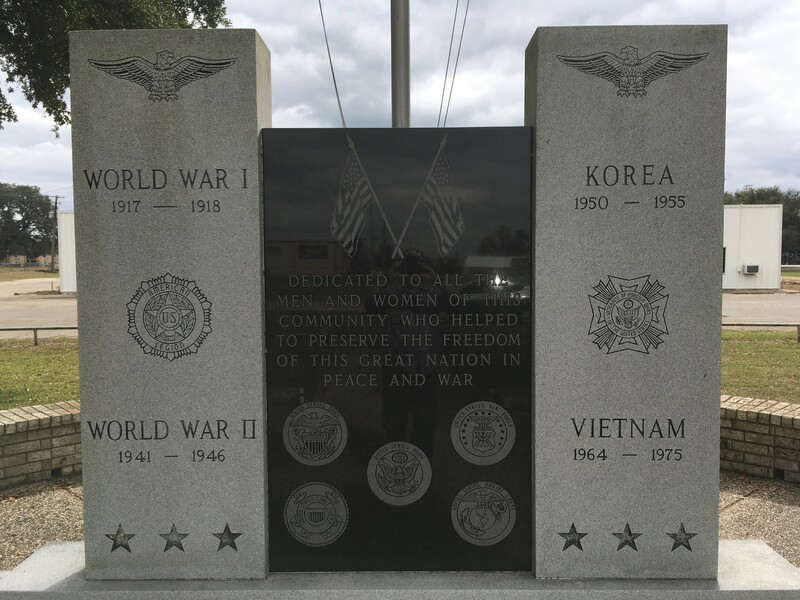 It was provided by the Maine & New Hampshire Granite Corp. One columnar section was damaged, and given to the Ladies Auxiliary of the Veterans of Foreign Wars (VFW). The VFW turned it into a memorial to American war dead, and erected it in front of Alexandria's Union Station in 1942. 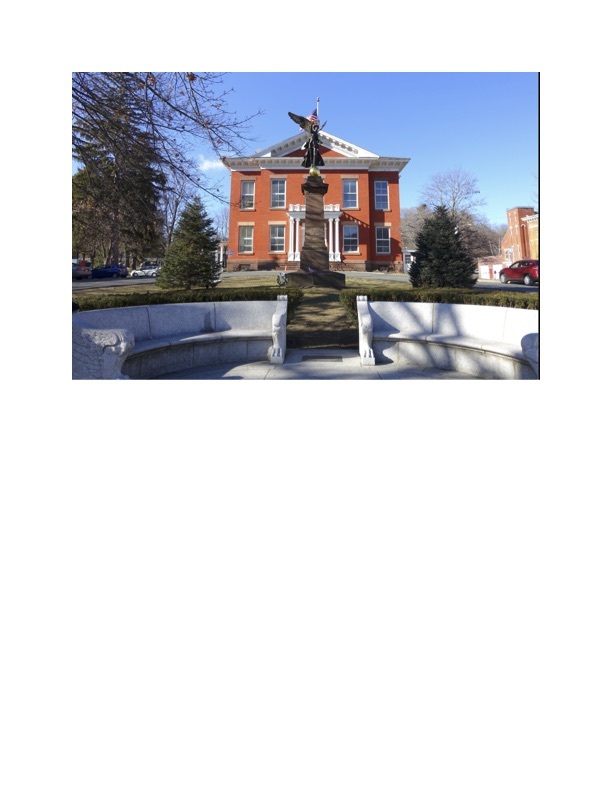 Address : Town Hall, Main St.
H.L. Movius designed this pair of curved granite benches, with ends formed as wings with three-toed claws, all placed on a wide-semicircular granite base. This was a gift of Mrs. F.B. Robins of Toronto, Ontario, in 1926 in memory of her son. Alfred Skitt Reed, a veteran of WWI. The Fayetteville County, TX one is a bit more difficult, because the granite monument says one thing, and in actuality, that has been changed. It says the plaques listing soldiers names are inside the courthouse when they have been moved outside and attached to metal stands around the granite monument. In addition, one of the new ones I am submitting today needs two photos also, because you can not tell from the full photo what you are looking at, because the bronze plaque is mounted flat to the ground and the name plaques are randomly and individuals mounted to a nondescript concrete block. It is an all wars Memorial Monument in Columbus, TX. It stands in front of the Veterans Memorial Center. 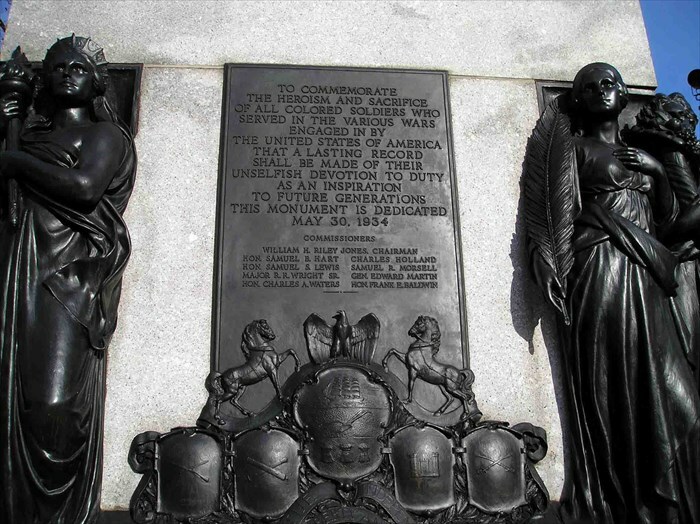 The front of this vertical granite monument is adorned with an allegorical female figure representing "Justice" flanked by two groups of three African-American officers, soldiers and sailors representing those from Pennsylvania who served in American wars. The figure of Justice is dressed in long flowing robes and wears her hair pulled back and braided around her face. She stands on a low stepped platform holding up a small wreath in each hand to represent Honor and Reward. The African-American Servicemen are dressed in the uniforms of the various branches of the military. On the back of the monument four allegorical female figures, representing the principles for which wars are fought, flank a bronze tablet. On the proper left of the tablet stands "War" holding a shield and wearing a helmet. Next to her stands "Liberty" carrying a torch and wearing the headdress of the Statue of Liberty. 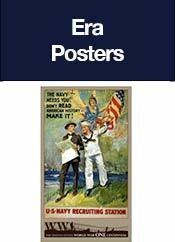 On the proper right of the tablet stands "Peace" carrying a large palm frond. Next to her stands "Plenty" holding a filled cornucopia. The monument is topped with a bronze Torch of Life surrounded by four eagles. 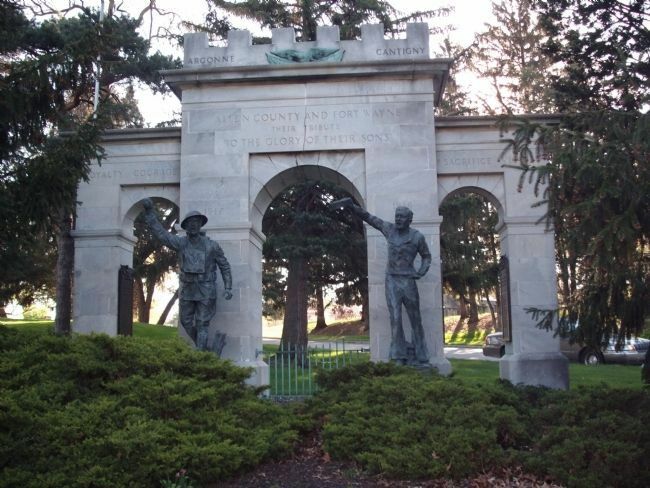 This monument includes E. M. Viquesney's "Spirit of the American Doughboy" and "Spirit of the American Navy" statues and is located at the entrance to Fort Wayne's Memorial Park from Glasgow Avenue. Steven P. Rebeck sculpted this pair of monuments, a ten foot tall granite soldier to honor Civil War veterans and a shorter bronze one tor WWI veterans. A large triangular stone is set in a narrow grass island at the South entrance/exit to Sutter Creek. 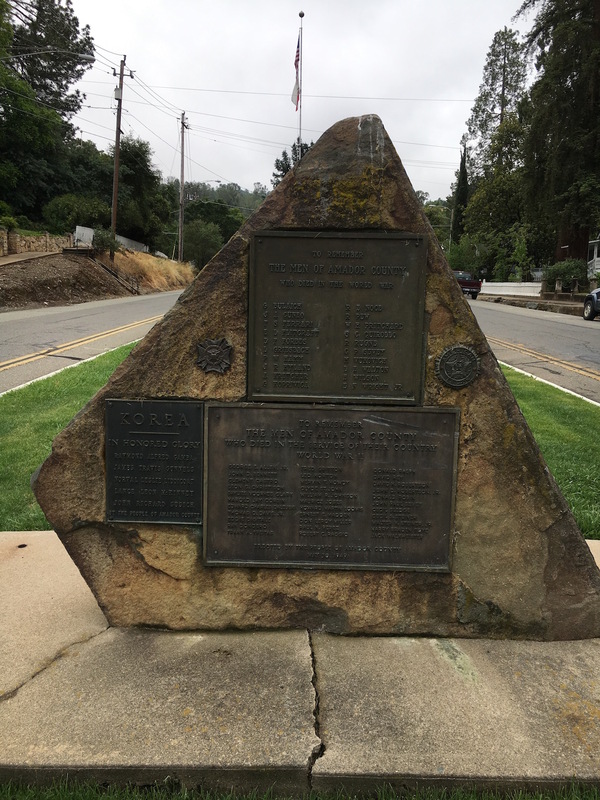 This memorial to the men of Amador County was the original brass plaque placed on the stone. Later plaques were added to the stone commemorating those lost in later foreign wars. The back side of the stone has a plaque for those lost in Vietnam. The stone is multicolored: golds, reds, greens (partly due to moss and lichen). The brass has not been polished in recent years, but it is still easy to read. When exiting town South on Old Hwy. 49, the WWI plaque is visible, facing the driver on the left side of the road. 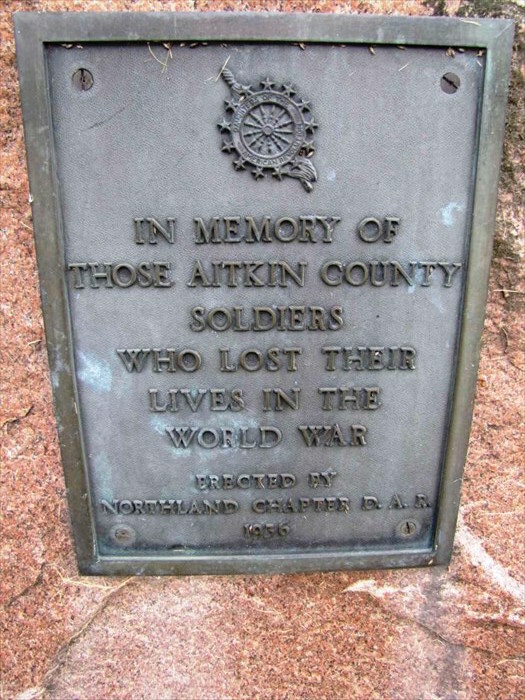 When entering town, headed North, the stone is to the left with the WWI plaque visible only after you pass. The "Vietnam in Honored Glory" plaque faces those entering from the South. Jersey City Unveils Memorial for 147 Soldiers Who Fell in War. A monument to 147 soldiers from Jersey City who fell in the war was unveiled at Pershing Field, Jersey City, yesterday afternoon, as part of Jersey City's Independence Day exercises. A feature of the ceremony was the dropping of roses over the field during the services. Lieutenant Stanton Weissenborn, a former army air pilot, circled above the crowd for two hours, and at frequent intervals dropped a rose until 147, one for each man who died, had fluttered down and made an immense bouquet at the foot of the monument. 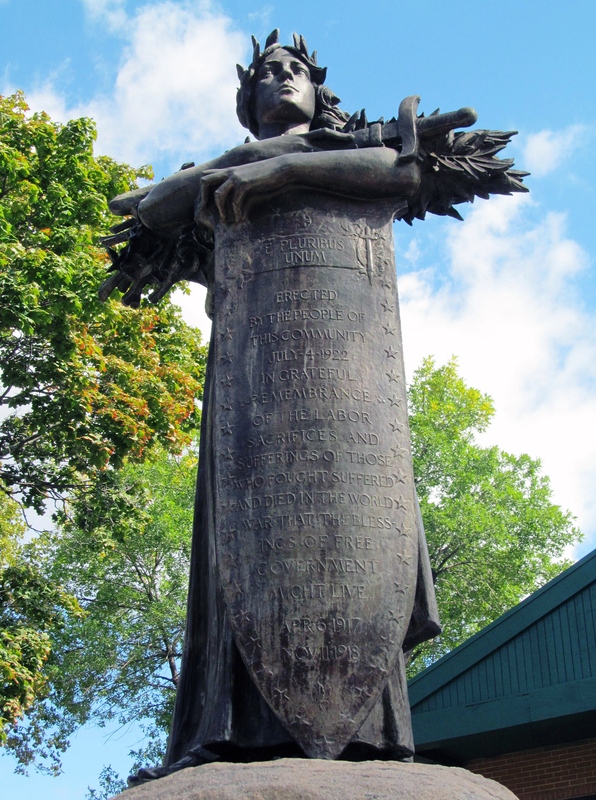 The memorial is a life-size bronze figure of a woman, her arms filled with laurels. It is called, "Triumphant America." 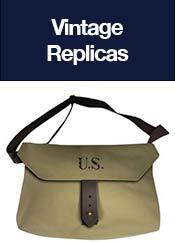 It was bought by the people of Jersey City through voluntary subscription. 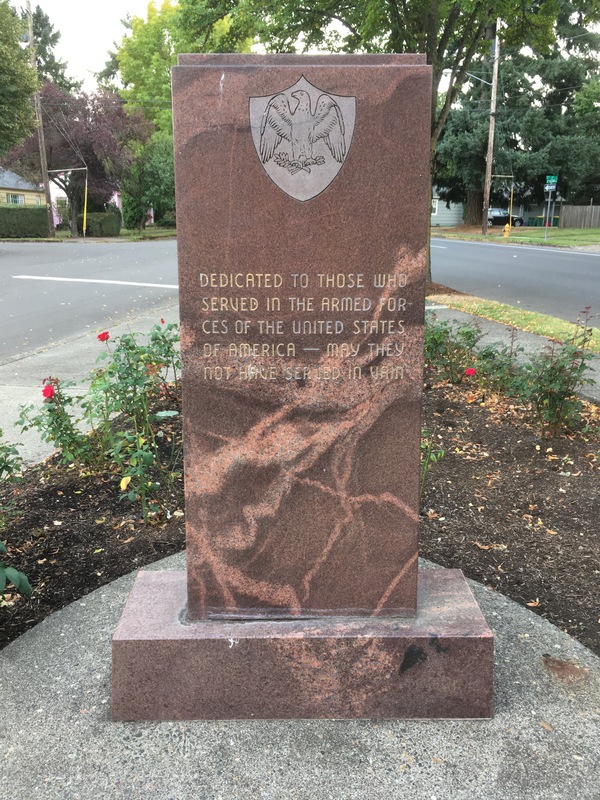 Julius Beger, Chairman of the Monument Committee, presented the memorial to the Captain E. Fisk Post of the American Legion, and Arthur Liesemgang, post commander, presented it to the city. Lieutenant Louis Van Den Ecker, representing the French Consul General at New York; Dr. Foster Timothy of New York, representing British veterans, and Lieut. Col. Kerfoot, U.S.A., were among those who took part in the exercises. 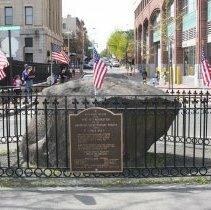 This monument was erected in 1925 to commemorate Hoboken's role as the US Army Port of Embarkation during World War I, and honor the 3 million troops who passed through Hoboken's port. The monument contains a bronze tablet mounted to the face of a granite boulder. 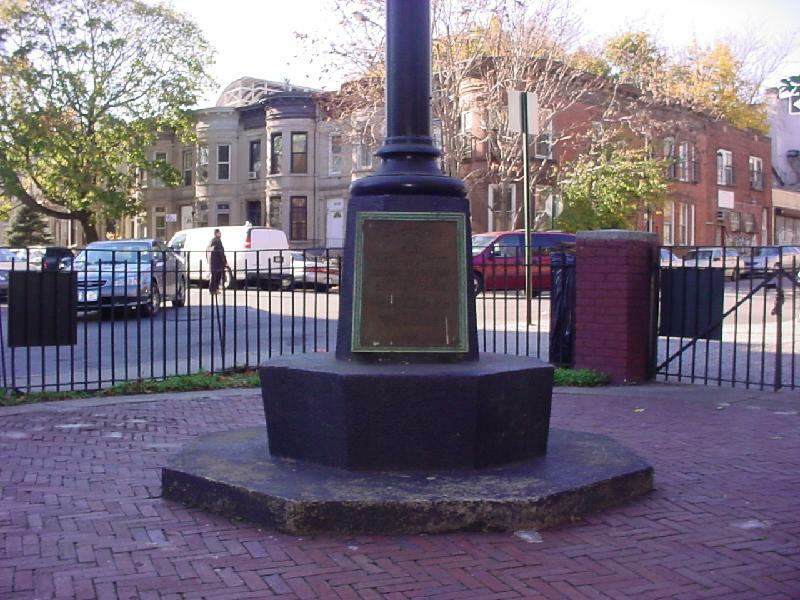 It was erected by the Hoboken Assembly, Fourth Degree, of the Knights of Columbus. 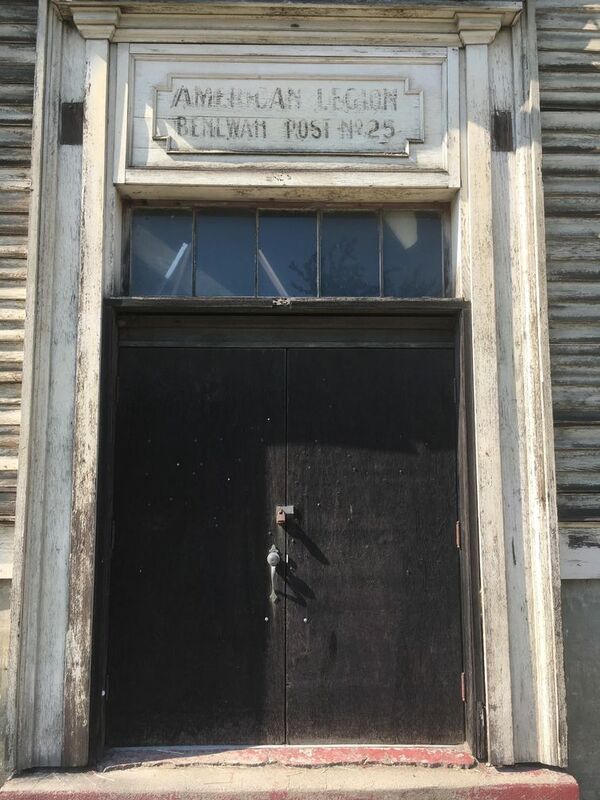 The current plaque was fabricated in 1978 and paid for by Hudson County. The boulder originally sat on Pier 4 near River Street. 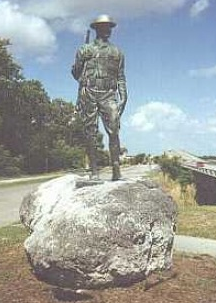 It was moved to River Street near Pier B in 1976. In 2002-03, with the completion of the Hudson River Waterfront Walkway, it was moved to its present location at First Street & Pier A. Narrative adapted from Hoboken Historical Museum website. Address : South 7th St. & South 8th St.